...then took off at great speed disappearing into the distance. Huge globe, surrounded by fire, made whistling noise, flying at high velocity. John Martin spotted a fast-moving dark object high in the southern sky. He could see it was the size of a "large saucer." Martin apparently saw a classic flying saucer (he may have been the first to use the word "saucer" in a UFO report. It kept pace with the RAAF pilot's aircraft before departing rapidly. Shot away, disapeered in a matter of seconds. Variously described as traveling slower than airplanes or crossing the sky in seconds at fantastic speeds. Astronomer and two students at Syracuse campus see an unending stream of elliptical or circular objects cossing the heavens, obliterating the stars as they passed at a high rate of speed through refractor telescope. Reports came from Wisconsin, the first of which involved a 'saucer' that travelled at a speed of 6,000 miles per hour, according to a flying instructor and student pilot who had just taken off from Eikhorn. Finally all the humanoids re-entered the object, which took off at high speed emitting a loud whining sound. Fast moving ellipsoid object over White Sands Proving Ground, Holloman Air Force Base, and Los Alamos. An 'egg-shaped' craft of fantastic size traveling at incredible speed of three to four miles a second. Capt. Jack Adams and First Officer G.W. Anderson. "It was about 1,000 feet above us and about a half mile away," Anderson told intelligence officers. "It zoomed at terrific speed (perhaps as much as 700-1,000 m.p.h.) in an arc ahead and above us, moving from south to north . . . . Source: UFOs: AHistory(June-July 20,1952)Loren E. Gross, "Flyers Report Saucers Near Atomic Plant"
The UFO appeared to be about 2,000 feet high and moved ".. faster than any known coventional aircraft." It was seen for about 20 minutes and put on quite a show. Two silver cigar-shaped objects appeared. A third cigar-shaped object flew by at high speed. Source: Look Magazine, June 24, 1952 issue, "Hunt For The Flying Saucer"
The objects varied from a yellow to gold in color, moved south to north at a "high rate" of speed. UFOs: A History(January-May, 1952)Loren E. Gross, "Memorandum for Mr. Levy. Prepared by the Inspector General, Directorate of Special Investigations, Hq. USAF, Washington, D.C. OSI Records. BLUE BOOK Files. After hovering over the atomic plant, it gained speed, reversed its course and then disappeared quickly. Moving too fast to be airplanes. Accelerated at fantastic speeds. One of the objects was tracked at about 7,000 miles an hour according to calculations made by an operator at the center. NATO exercise. Royal Air Force's Topcliffe facility. Meteor jet preparing to land at nearby base. Silvery UFO, estimated at 10,000 feet, As the object descended, it described a pendulum-like motion in the air, from left to right. then the object stopped, appeared to rotate, and finally departed at great velocity. One orange blimp-shaped object, 80' long and 20' high, flew at treetop level, then climbed out at 45' and tremendous speed. Turned toward UFO and it disappeared in a burst of speed. Doctor Martinet. "After that, it came to the apparent vertical location above the cablecar station of Revard, went down a little, then suddenly accelerated and disappeared as fast as a thunderflash." Speed varied from hover to 1,000 m.p.h. Mr. and Mrs. Bordes. The mysterious object moved back and forth and finally flew away at high speed. A long, coloful flame shot out of the back as it cossed the highway directly over the pick-up truck and vanished at tremendous speed. Richard Holsapple. Holsapple and his father saw three "strange objects" in the sky that were "flying faster than any jet I ever saw. Two were silver and another was somewhat darker." Acoording to UFO researcher A.G. Dittmar, witnesses in the area watched the base scramble jets after the UFO. Instead of evading the jets, however, the UFOs appeared to tease their pursuers by waiting until the jets approached, then outrunning them with a burst of speed, only to wait again. It then took off "just like a shooting star" and disappeared into the sky. Caught sight of a light zigzagging across sky at incredible speed. Stopped in mid-air, hoverd for a while, took off at high speed. Several dozen white UFOs appeared above the city, moving at speeds of up to approximately 840 miles per hour. The objects were described as "white dots" and in some cases left a trail behind. March 12, 1965. Everglades, East Fort Myers, Florida. Source: Keyhoe, Donald E., and Lore, Gordon I. R., Jr. Strange Effects from UFOs. NICAP, Washington, D.C. (1969), pages 12-16. Source: Hall, Richard. Uninvited Guests. Santa Fe, New Mexico (1988). pp 250-251. Source: Clark, Jerome. The UFO Encyclopedia: Volume 1 (2nd Edition). 1998. pp. 362-364. James Flynn. Then it took off toward the Southwest at a high rate of speed. Soon, however, it returned to the same location again. One humanoid, large head; oval object landed on estate, being emerged, gestured, reentered craft, took off straight up at high speed. On March 8th at 2:30 PM there was a good quality daylight disc sighting at Chesterton, Indiana. 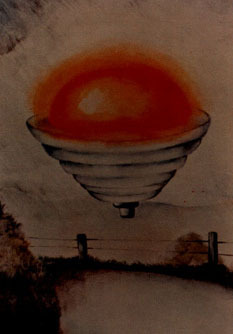 (Exhibit 6a) The UFO, surrounded by a bright, misty haze, hovered above a cloud bank for 4-5 minutes. It then changed angles and sped away. Henrico County Sheriff A.D. "Toby" Mathews. Mathews said he ran back inside his house to get a flashlight, and when he returned and shined it on the craft, the UFO turned slightly, emitted a burst of light and "took off like a bullet, just tremendously fast." The witness walked toward it yelling and waving his arms, where upon it moved slowly and silently away; then it began to spin rapidly with a loud whirring sound, tilted at an angle of 30-45 degrees, and took off at a very high speed. He noticed a smell lingering in the air like that from a lighted match. Group Captain RAF (Rtd). It had a very large wing span and was moving at about the speed of a modern passenger aircraft. The Case was investigated by the northern representative of the Tasmanian UFO Ivestigation Centre, and subsequently reported to Flying Saucer Review by. W. K. Roberts. It then rose vertically upwards, fairly fast, and was lost from Mrs W's field of vision. November 28, 1974. Shabonna, Illinois. Source: Skylook No. 89, page 5. After pacing the aircraft for eight to ten seconds, the object tipped slightly and the pilot saw that it was actually round and not an ellipse. As it tipped up at an angle it accelerated toward the east at a fantastic speed and was gone. Artist conception by Brian James. Once the light the was out, the UFO was clearly seen; and it departed "in a flash." Its departing speed was temendous, Smith said. and watching it leave was "like watching a tracer bullet going away from you." Airport Terminal Radar Controller, Julio Intrian Diaz, registered the blip of Carlos's plane on radar, the UFO executing a 270-degree turn in a radius of three or four miles at a speed of 450-500 nautical m.p.h. Object disappears at extremely high speed. Private pilot reports three arrow-shaped objects flying in formation and disappearing at high speed. Metallic disc with stationary lights, descends rapidly to tree top level and maneuvers around, before departing at a high rate of speed. Officers with in 60' of object before it took off at a high rate of speed. After a few moments the object shot away at a very high speed. Plane was in excess of Mach 2.2 and the object stayed within 50 feet off the left wing of the aircraft. Manuel Alvarez. One human-size being, helmet, luminous garb, descended on ladder from hovering disc, waved at fishermen, reentered craft, which took off at high speed. Pilot Frederick Valentich: "He's flying over me two or three times at speeds I could not identify..."
Marshall County Deputy Sheriff Val Johnson. The next thing Johnson knew, the light was shooting directly toward him, moving so fast that its passage seemed almost instantaneous. Alfred Burtoo. "And then I heard this whining noise, just as if an electric generator was starting up, and this thing lifted up then took off at a very high speed." The main reason the witness decided to report the sighting was that the object looked strange: a shape, with dots of lights, that maneuvered, circled a radio tower at very high speed. "Still watching I saw more of a movement and ran back to the door, and at that time the small lights came on around it and it shot upward at a terrific rate of speed, leveled off, and went to the north over a hill and tall trees and was out of sight in seconds." Throughout the late 1980s, Cumbria was the host to many visitations of the Flying Triangles. Sometimes these craft were described as being black and sleek in design, with the ability to accelerate at great speed. Source: MUFON HQ, FI Franklin Reams. It was traveling at a high rate of speed. He later told investigators that he had been impressed by the slowness with which the object moved originally, then its speed as it flashed away. Belgian army lieutenant colonel, Andre Amond. Two young boys were retrieving groceries from the car when they noticed a bright light approaching at great speed emitting a jet-like sound....The dome then closed and the disc departed with the same jet-like roar. An unconfirmed account indicated that the nearby NASA facility at Wallops Island had lost its radar about the same time. It moved slowly, only about twenty-five miles an hour, but then would accelerate at fantastic speeds. It was reported to have dropped from an altitude of 7500 feet to 750 feet in about one second. Goat herder, Flores de Mamani. The sphere then shot away at tremendous speed. Fall, 1990. Almont, MI, north of Detroit. Illustration by witness Tim Todd. Tim Todd. I remember walking down the driveway with my son, then the next thing I remember is standing out in the field north of my house still looking at the UFO, when suddenly it went from approximately 90 or 100 feet straight up in the sky to where it was a pinpoint of light. It just looked like another star. This happened in under a second. We continued to watch it for quite a while when it took off in a northwesterly direction like a meteor and was gone in a second. .
Trucker Carlos Alberto de Jesus. The object then rose up, rotated and shot away at incredible speed. Source: UFO INTERCEPTS AIRCRAFTOVER PARAGUAY By Jose Alfonso Ramirez. MUFON Journal February 1994 Number 310 [PDF]. Cesar Escobar. "The most shocking thing was when I heard the pilot say that the object flew straight toward his airliner and passed over it at an incredible speed." The humanoids collected ground samples and vegetation and then re-entered the object, which took off at high speed. Just after midnight they spotted something that crossed the sky from north to south in a matter of seconds. Ian Macpherson. Suddenly, it accelerated away at incredible speed, many times faster than a jet aircraft, and vanished in a couple of seconds. Flight recorders: "...we just had something go down the [right-hand side] just above us very fast." Silvia Bedoya. Soon the humanoids entered the large object and all the objects shot away into space @ high speed. Haraldo Westendorf. Then, to his amazement, the object rose straight up at tremendous speed. For the first time, Westendorf was scared, because he believed the object's rapid acceleration might produce a shock wave of turbulence that could overwhelm his own plane. As a trained pilot, he knew that air traffic controllers recommend staying at least three minutes behind a large aircraft to avoid such turbulence. He estimated that the unidentified object probably weighed at least three times as much as a 747 jumbo jet, so its shock wave should be huge -- and he was only a few hundred meters away. He quickly began emergency procedures in case his plane went into a spin or a stall. But to his surprise, he did not encounter any turbulence. "...at about the same speed as a slow moving plane." After that, the humanoids boarded the object, which took off at high speed. Carlos Airton Machado. The figures suddenly entered the object through an opening and it rose up at high speed emitting a loud whistling sound. Adailton Rodrigues. After about 5 minutes the humanoids entered the object through an open door-like opening and the craft then shot up at fantastic speed. Odete Fortini. After a few minutes of investigating the area they re-entered the object, which became bright again and left at high speed. Five students camping in a deserted beach, including Luis Carlos Prima. They ignored the witnesses and after several minutes reboarded the object, which took off at high speed. The clearly observed object shot straight up leaving a hole through the clouds. Massive UFO described as having no seams or riveting taking off at tremendous speed pursued by fighter jets . Multiple witnesses. Ricky Sorrells. It took off so fast that if I blinked I would have thought it vanished but I had my eyes on it, and I know it took off flat at a 45 degree angle. It almost looked like a flying faris wheel with red and white blinking lights around the edges, it was spinning and moving very fast. Their speed is sometimes very high, 19 km/sec has been measured with wireless measuring instruments (radar). Accelerations are so high that no man could stand it; he would be pressed to the wall and bruised. The accuracy of such measurements has not been doubted. If there would be only 3 or 4 measurements, I would not rely upon them and would wait for further measurements, but there is existing more than 50 such measurements; the wireless sets (radar) of the American Air Force and Navy, which are used in all fighters, cannot be so inaccurate that the information obtained with them can be doubted completely. -- Hermann Oberth.